The first stories published by the Hippocratic Press are the five titles in the Dr. Hippo Series about common childhood illnesses: cold, fever, ear infections, sore throat, and vomiting and diarrhea. Each picture book includes a separate Parent Guide written in question/answer format. The Parent Guide answers common questions about children health issues and offers parents advice about how to comfort children at home and when to call the doctor. I received these five books to share with my family and they are just wonderful. I love how Charlotte make the stories come alive and very appealing to children so they can understand what's going on with their bodies when they are sick and also give parents some control in knowing what to do and what's normal and what to expect. I'm so glad for these because I do panic a bit when my children get sick and I'm not sure if something worse is happening on the inside. My kids want me to read all of them at one time in every setting! They can't get enough! I love these books and will buy some as gifts for my family with younger children. The Hippocratic Press was founded by Dr.Charlotte Cowan with the primary mission of publishing medical children's stories that entertain, educate and reassure both parent and child. A board certified pediatrician, Dr. Cowan worked with parents and their children for many years before leaving her busy practice at the MassGeneral Hospital for Children in Boston. She knows childhood inside out, and she has taken care of children both when they have been sick and when they have been well—but stumbling over developmental issues. 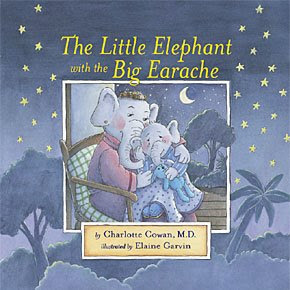 I hope that The Little Elephant with the Big Earache helps to reassure children and their parents as it educates them about ways to take care of earaches at home and suggests when to call or see the doctor. The accompanying Parent Guide, Ear Infections Made Easy, should certainly answer any questions parents may have. The decision to use antibiotics depends on several factors and should be made after careful consideration by the pediatrician and parent. 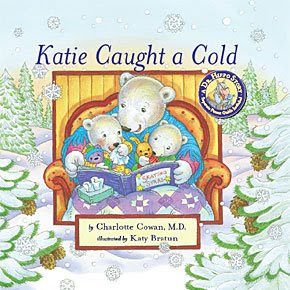 Katie Caught a Cold is a story written to illustrate the excellent care of a child with a cold. Katie is kept comfortable by her mother who avoids over the counter cold and cough medicines. Dr. Hippo explains that antibiotics are unnecessary and makes sure to tell Katie's mother when/if she should worry about Katie's illness. The separate Parent Guide, Conquering the Common Cold, offers helpful tips for worried parents. Peeper Has a Fever demonstrates an intelligent and thoughtful approach to caring for a child with a fever. In addition to the comforting story, the included Parent Guide, Figuring Out Your Child's Fever, offers clear suggestions about calling the doctor for advice when your child has a fever. 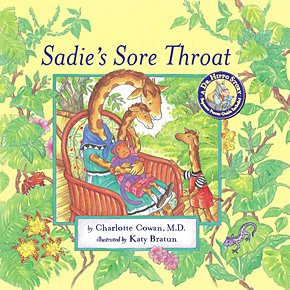 Sadie's Sore Throat tackles the problem of strep throat in children. It shows both parent and child not only how to take care of a child with a sore throat but also what to expect at the doctors office. The Parent Guide, Simplifying Sore Throats, explains the appropriate care of a child with a sore throat; in the case of strep, this includes a full course of antibiotics after a visit to the doctors office for a necessary laboratory test. 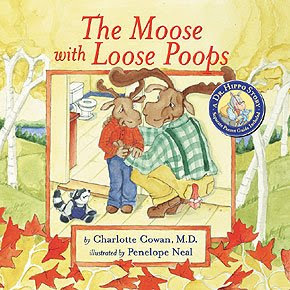 The Moose with Loose Poops is written with warmth and whimsy to help children feel better when they have to deal with vomiting and diarrhea (gastroenteritis). The included Parent Guide, Getting Through Gastroenteritis, explains what to expect during this illness, how to avoid dehydration—including tips for how much fluid to give a sick child—and when to call the doctor. This collection of stories has been written to entertain, educate and comfort sick children—and their parents. I hope they both feel better soon! Charlotte has offered to give an autographed set of the Dr. Hippo Series to one lucky reader. Please remember to leave an email address where I can reach you if you don't have a blog with your email. Giveaway ends June 20th 11pm central. Winner will be announced here and via email. I left a comment at Dr. Hippo's on his car seat safety question. Please include me in your giveaway. Good info! Thanks for the giveaway, this would be awesome! I left a comment on the swine flu post. I left a comment on the Swine Flu article that was posted on April 29th. I tried to leave a direct link but for some reason, my copy and paste functions are not working. I left a comment as Ilissa H.
I commented about the carseat article. I subscribed to Dr Hippos blog. http://drhippo.com/blog/2009/06/11/what-has-happened-to-h1n1-has-the-swine-flu-flown-away/#comments i commented there, but I guess they have to review the comments first cuz it didn't show up right away! hmph! oh well! Following and subscibing to your blog. subscrbing to Dr. Hippos blog.